As a symbol of native British resistance to the Roman invasion of the 1st Century AD, the name of Caratacos (or Caractacus, or, to the Welsh, Caradoc) stands alone beside that of Boudicca. He has inspired a cantata by Edward Elgar, and features as a character in a number of novels, from Henry Treece's The Dark Island, through Manda Scott's Boudicca series to Douglas Jackson's Claudius. We have no idea what he looked like, but William Blake's imagined portrait of him seems to have stuck in the public imagination, and has influenced many of the fictional descriptions of him, including my own. 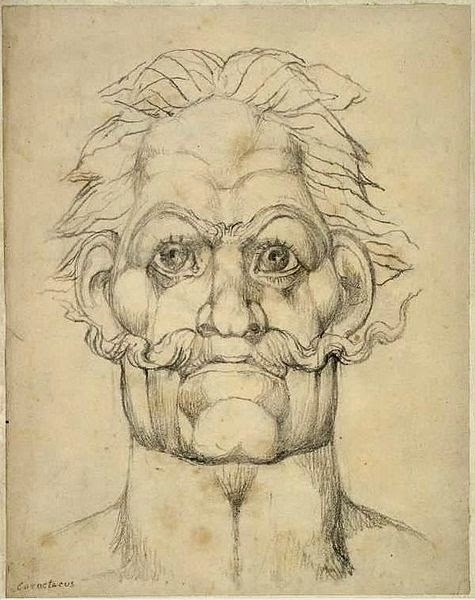 Caratacos, as imagined by William Blake (image is in the Public Domain). What we actually know about him is quite limited. He was one of the three acknowledged sons of the Catuvellaunian king, Cunobelinus. During his father's lifetime, he seems to have been closer to his uncle, Epatticos, and together they waged war against the Atrebates and Regnenses, extending the territory of his tribe southward into Hampshire and West Sussex. Coin of Caratacos, minted at Silchester (image is in the Public Domain). These conflicts, apparently continued by Caratacos after the deaths of his father and uncle, provided the Emperor Claudius with the pretext for invasion, when Verica, probably one of the heirs of Julius Caesar's unreliable ally, Commius, fled to Rome. According to Cassius Dio, Caratacos and his brother, Togodumnus, were defeated in battle by the Romans (probably at the crossing of either the Medway or the Thames), with Togodumnus being killed, and Caratacos escaping. Shortly afterwards, the Catuvellaunian stronghold of Camulodunum (Colchester) capitulated to the Romans, and Claudius Caesar personally took the surrender of a number of British chieftains. Caratacos, however, was not amongst them. He travelled west, presumably with some of his elite warriors, and later appeared in the territory of the Ordovices, in what is now Wales, as the leader of a guerrilla insurgency against Roman expansion. Although many of the tribal elites may have been linked by marriage, the territories of the Catuvellauni and the Ordovices were very far apart, and Caratacos must have had remarkable charisma, as a defeated king, to be accepted as a leader by such a distant people. According to Tacitus, Caratacos's insurgency continued for nine years before he was defeated in a major battle somewhere in the Welsh marches. 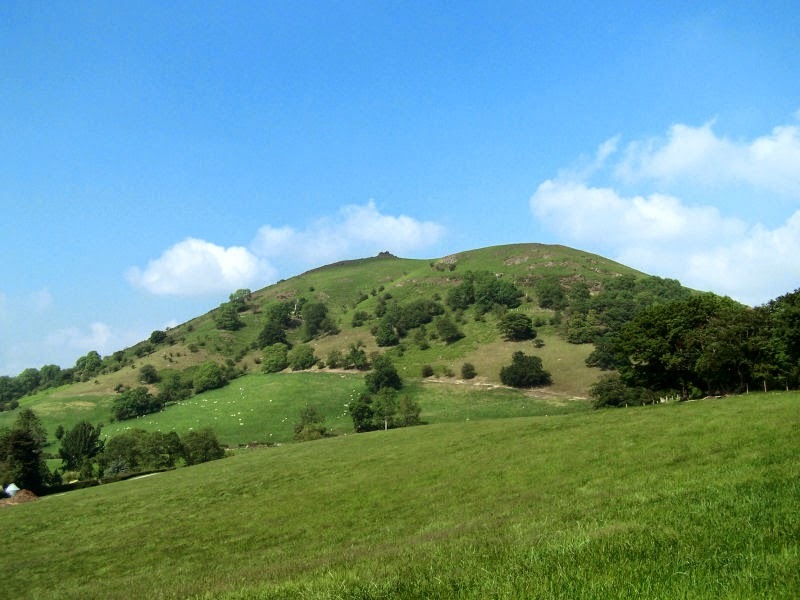 The precise location of the battle is not known, but Caer Caradoc in Shropshire has been suggested (perhaps only because of its name), as has the "British Camp" near Malvern. Caer Caradoc, Shropshire. Photo: Oxyman (licensed under CCA). 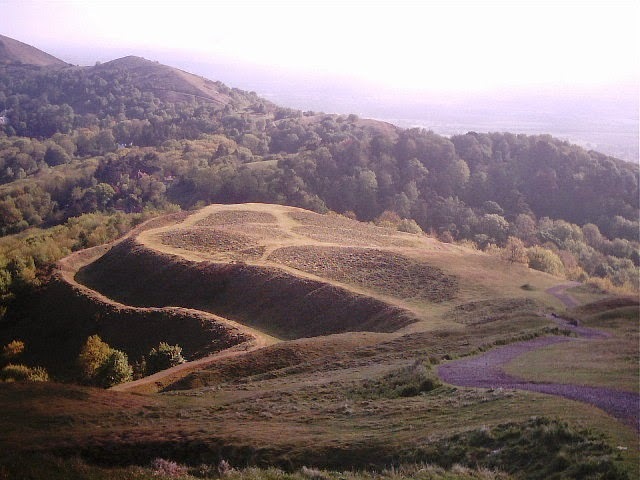 "British Camp" near Malvern. Photo: Richard Higgs (licensed under CCA). Tacitus tells us that Caratacos's wife and daughter were captured, but that Caratacos himelf escaped into the territory of the Brigantes. It seems unlikely that he would knowingly have thrown himself upon the mercy of their queen, Cartimandua, who was known to be a Roman ally. It may be that he had some sort of agreement with her husband, Venutios, which would have entailed her overthrow. The plan back-fired, and Cartimandua handed Caratacos over to the Romans. "Had my lineage and my rank been matched by my moderation in success, I should have entered this city rather as a friend than as a captive; nor would you have scorned to admit to a peaceful league a king sprung from famous ancestors and holding sway over many peoples. My present lot, if to me a degradation, is to you a glory. I had horses and men, arms and riches: what wonder if I lost them with a pang? For if you would rule the world, does it follow that the world must welcome servitude? If I were dragged before you after surrendering without a blow, there would have been little heard either of my fall or of your triumph: punishment of me will be followed by oblivion; but save me alive, and I shall be an everlasting memorial of your clemency." Caratacos before Claudius. 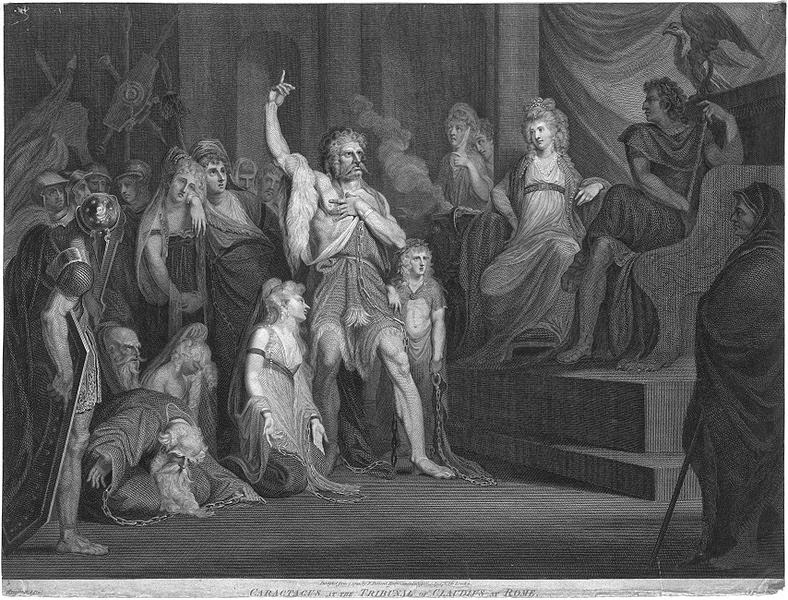 18th Century Engraving by Andrew Birrell, from a painting by Henry Fuseli (image is in the Public Domain). Caratacos was allowed to live out his days in Rome, presumably with his wife and daughter, although nothing is known about the time he spent there. Subsequent traditions, including the suggestion that he later became a Christian (or had already converted before his capture), have no sound basis in evidence. He had, however, secured his place in history. Mark Patton's novels, Undreamed Shores and An Accidental King, are published by Crooked Cat Publications. 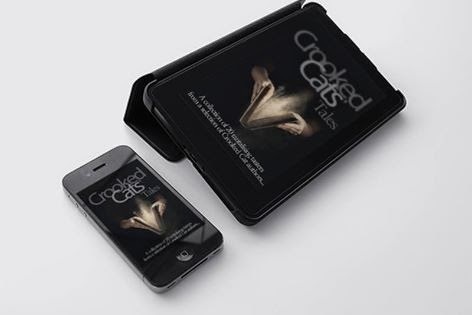 E-book editions can be purchased from the Crooked Cat Bookstore, and paperback versions from Amazon UK and Amazon USA. This blog-post is a shameless piece of advertising. Shameless because the product I am advertising is available to everyone, for free. This is, after all, World Book Night, the whole point of which is to give books away, and my publishers, Crooked Cat, are offering an anthology of short stories written by some of the authors whose books they have published over the last couple of years. It can be downloaded from Amazon. There are twenty stories by different authors in the anthology, and they cover the full range of literary genres published by Crooked Cat, from contemporary and historical fiction to fantasy, humour, romance and murder mysteries. 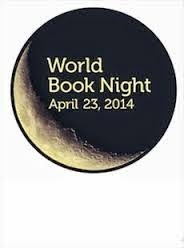 As one of the authors, I have had a preview of the anthology, and a very rich and diverse selection it is. One point that many of the stories seem to have in common, however, is a deep attachment to a sense of place, with settings ranging from Finland through Ireland, the Netherlands, France and Spain to Kenya and the USA. 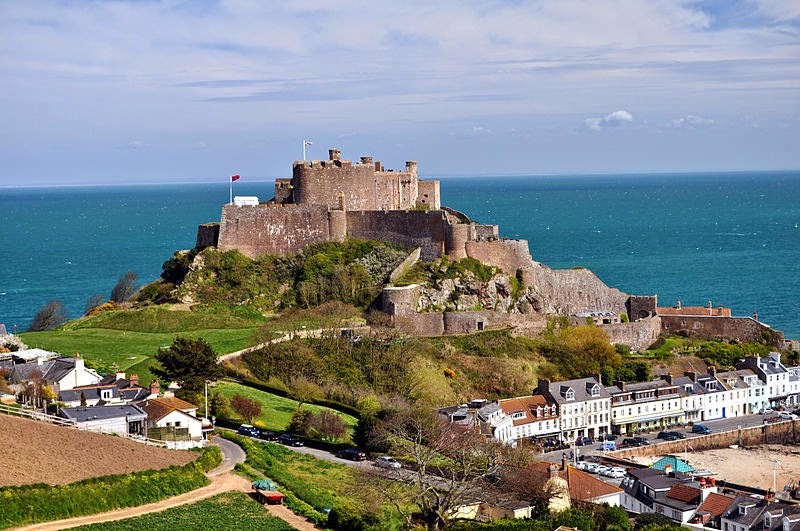 With this theme in mind (there is no specific theme to the anthology itself), I thought that I would give a brief tour of the location for my own story, "The Thread that Binds," a historical story within a contemporary one, and set in the north-east corner of the island of Jersey, in the Channel Islands. I was born and brought up on the island, but lived in the south-western parish of Saint Brelade. Nowhere is truly far away, however, on an island that measures ten miles by five and, if we were "on the ground" rather than "in the ether," we could walk around these places in little more than an hour. We start with an ancient monument, "La Pouquelaye de Faldouet," built between five and six thousand years ago by the island's first farmers. 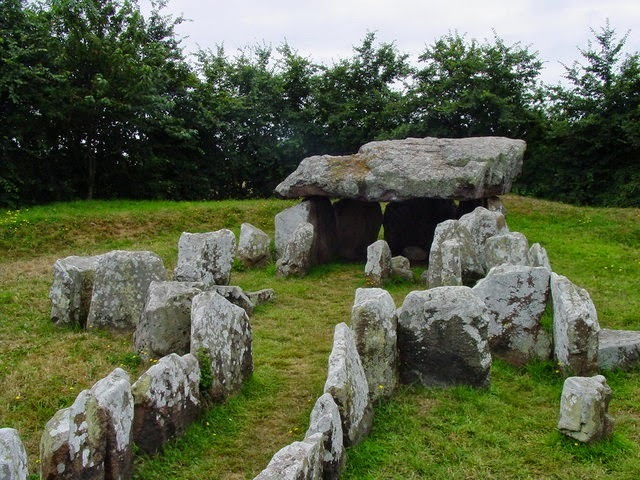 It is generally considered as a "tomb" (it is technically a "passage grave"), but only a small quantity of human bone was found there, and it may have been something more like a shrine to the ancestors. In the story, I have an excavation taking place there, but this is pure fiction: there have been no excavations on the site since the 19th Century. La Poquelaye de Faldouet. Photo: Colin Park (licensed under CCA). La Pouquelaye de Faldouet in 1840. Image is in the Public Domain. It is a place where I used to sit, as a teenager, and write poetry: this was when I was in Shakespeare's third stage of life (that of the lover, "sighing like a furnace, with a woeful ballad made to his mistress' eyebrow"), and before I discovered that I was actually better at writing prose. None of this poetry has ever been published, and I don't even have copies, having sent the originals to the person to whom they were dedicated. A short distance to the east is the Victoria Tower, a fortification built in 1837, as a precaution against French invasion. It is owned by the National Trust and, once again, everything that happens there in the story is fictional. 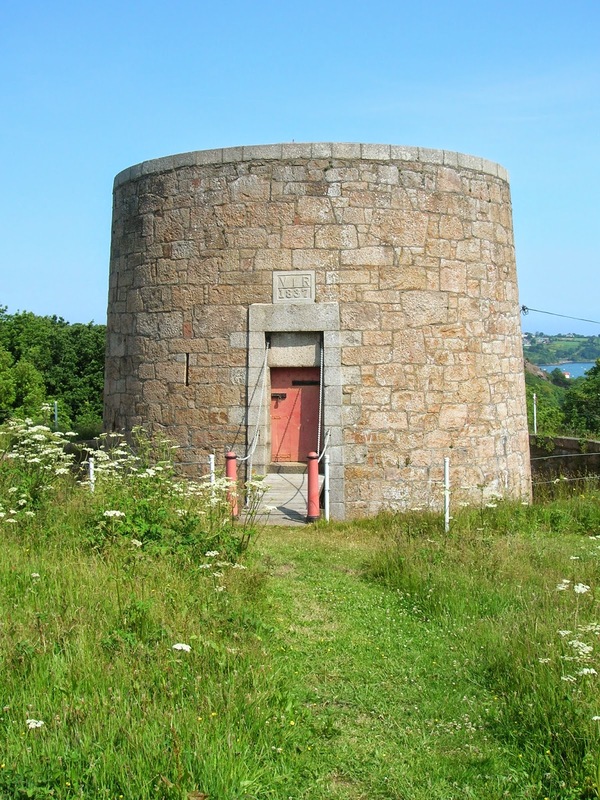 Although it is later in date, it is similar in form to the "Martello Tower" at Sandycove, near Dublin, which features in the first chapter of James Joyce's Ulysses, and the allusions to this work in my story are not entirely coincidental. The Victoria Tower. Photo: Acad Ronin (licensed under CCA). From the tower, one can look down on the picturesque harbour of Gorey, dominated as it is by the castle of Mont Orgueil, a site that was settled even before the passage grave was built (in my novel, Undreamed Shores, it is the "hill, covered in purple heather, where, it was said, Lizar had built the first village on the island"). It has been fortified since the Iron Age, and the castle itself saw action in both the Hundred Years War and the English Civil War (two of the key figures in English parliamentary history, William Prynne and John Lilburne, were imprisoned there). In the 18th Century it served as a base for British espionage against Revolutionary France, and the last shots to be fired in anger from the castle were aimed by soldiers of the occupying German army against aircraft of the RAF and USAF during the Second World War. Mont Orgueil Castle. Photo: Pawel ("PBM") Szubert (licensed under GNU). Beyond the castle can be seen the coast of France and, with a keen eye, one can pick out a group of rocks lying between the two. These are Les Ecrehous owned by Jersey, but periodically, and theatrically, claimed by the French). These little islets (they are vastly bigger at low tide) have no permanent population, but do have some small huts which are rented out to fishermen. There are also the remains of a priory, built in the 13th Century, and where masses were said for the soul of King John (who lost most of Normandy to the French, but retained the Channel Islands as the sole portion of William the Conqueror's original Duchy) until it was suppressed under Henry VIII (the most southerly outpost of the Dissolution). Les Ecrehous. Photo: Tswgb (image is in the Public Domain). My story is both a prequel (of sorts) to my first novel, Undreamed Shores, and a foretaste of my third, Omphalos, which will be published later this year. I have not, of course, revealed anything about the characters or the plot, which I leave you to discover for yourselves, along with the stories written by my fellow authors. The Boudiccan Revolt of 60/61 AD effectively put an end to urban life in Romanised south-east England. 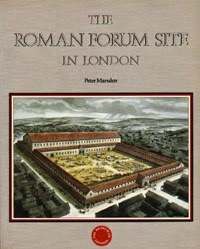 The three most significant cities, Camulodunum (Colchester), Londinium (London) and Verulamium (St Albans) had been burned to the ground, as evidenced by the archaeological record as well as the historical accounts. To the west, the city of Calleva Atrebatum (Silchester) may also have been burned, but other cities, including Noviomagus Regnorum (Chichester), survived. Although one legion had been virtually destroyed, and two further legions had sustained heavy casualties, reinforcements soon arrived and military control was re-established, probably within a matter of months. Restoring the civic infrastructure would take far longer. It is not entirely clear where the capital of the province was located between 61 AD and 78 AD. Colchester had been the capital prior to the revolt, but seems not to have been rebuilt before the late 70s AD. London would emerge as the capital but, again, reconstruction was slow. St Albans was not rebuilt until the Governorship of Gnaeus Julius Agricola (78-84 AD): an inscription naming him was found in the reconstructed forum, and can be seen at the Verulamium Museum. Inscription from Verulamium (St Albans), naming Agricola as the Governor who rebuilt the forum there. London is, perhaps, the most interesting case-study. Recent excavations have highlighted the importance of Southwark as a population centre both before and after the Boudiccan Revolt. Although evidence of burning has been found south of the Thames, the destruction seems not to have been as comprehensive as that to the north, and reconstruction took place at an early stage, with a market hall, workshops, houses and warehouses. There are also traces of one or more large and possibly public buildings, so perhaps Southwark served as a temporary home for the military and civil administration of the province. On the northern side of the Thames, attempts seem to have been made to rebuild the infrastructure, but had only partial success in attracting people to move back to live there. Roads were re-established, and an amphitheatre built in around 74-75 AD, but most of the area formerly occupied by shops and houses remained a wasteland. Water-lifting equipment was installed, and a bath-house built, but people stayed away. 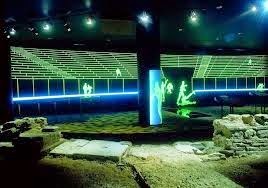 The Roman amphitheatre of London, preserved and presented beneath the city's Guildhall. 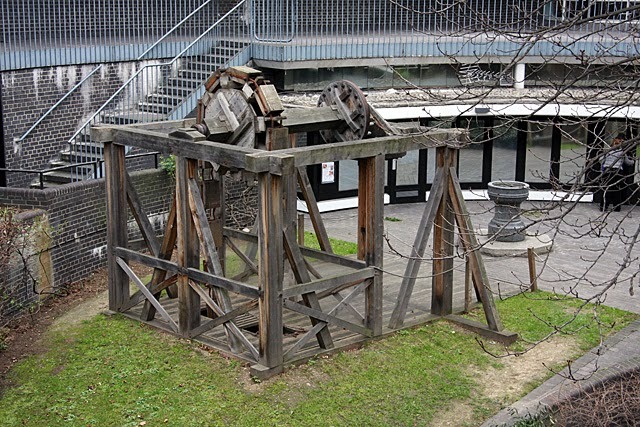 Reconstruction of water-lifting machinery of the late 1st Century AD, found at Aldersgate, London. Photo: Oxyman (licensed under CCA). "They hung up the noblest and most distinguished women, and then cut off their breasts and sewed them into their mouths, in order to make the victims appear to be eating them; afterwards they impaled the women on sharp skewers run lengthwise through the entire body." It was probably not until Agricola became Governor, almost two decades after the revolt, that people could be persuaded to move back en masse, and he may have had to set the example by moving there himself. Beneath Cannon Street Station is a building complex which some archaeologists believe to be the palace occupied by Agricola, and by subsequent governors. The amphitheatre was rebuilt, a new forum constructed, and houses, workshops and temples grew up around them. At around the same time, Colchester and St Albans were being rebuilt, but it was London that would serve as Britannia's capital for as long as these islands remained part of the Roman Empire. The building complex beneath Cannon Street Station, which some believe to have been the Roman Governors' Palace. Image: Udimu (licensed under GNU). Model of the reconstructed Londinium (the bridge being roughly in the position of the modern London Bridge), in the crypt of All Hallows by the Tower Church. The final session that I attended at the Folio Prize Fiction Festival, held in London last month, was on "structure" in fiction, and the panellists were A.S. Byatt, Sergio de la Pava, Sarah Hall and Sam Leith. De la Pava talked about the "early decisions" faced by a writer in formulating the concept for a book: should it be narrated in the first or the third person; in the past or the present tense; from one viewpoint, or from several? A.S. Byatt had previously spoken about the ways in which she had been influenced by George Eliot (and, specifically, by Middlemarch), but De la Pava prefers to "block out" his influences, fearing that "a certain inertia" might result from "following consciously in someone's footsteps." When I started work on my first novel, Undreamed Shores, I hadn't given much thought to structure at all. I knew that, like Homer's Odyssey, the story would be based around a journey, and I assumed that the best place to start was at the beginning. The first draft, therefore, introduced the protagonist in his home environment, thinking about and preparing for the journey ahead of him. My first beta-reader, however, found the opening of this draft much too slow. "Re-read The Odyssey," he suggested. It doesn't, of course, begin at the beginning: in fact, it begins very near the end (with Odysseus's son, Telemachus, setting out to discover what has become of his father). It was my first serious lesson in narrative structure, and one that has stayed with me. Although neither of my published novels begins at the beginning, both tell a single story: they embody what Aristotle, in his Poetics, called "Unity of Action" (the only "unity" that Aristotle considered to be really important - the concerns with "Unity of Place" and "Unity of Time" derive largely from Renaissance re-workings of the Poetics). Arguably they also embody a fourth "unity," of which Aristotle says nothing, that of "consciousness" or "viewpoint." This "unity" is, perhaps, specific to the novel as a genre (Aristotle was concerned with narrative poetry and drama), and some of the great historical novels, from Marguerite Yourcenar's Memoirs of Hadrian to Hilary Mantel's Wolf Hall and Bring Up the Bodies, tell a single story from a single viewpoint. 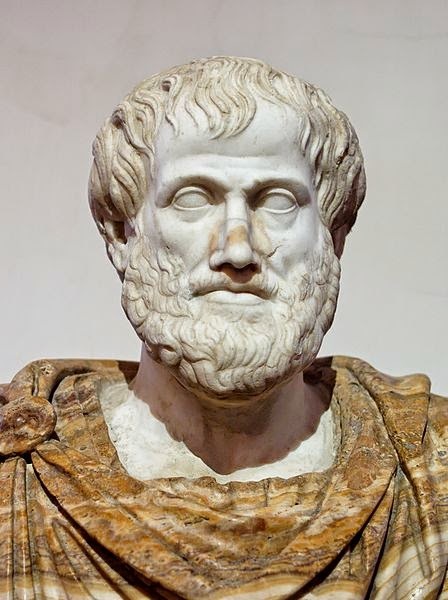 Aristotle, author of the World's first (and still one of the best) "how to write" books. Photo: Jastrow (image is in the public domain). Not all historical fiction, however, follows this pattern. One could hardly imagine War and Peace told from a single viewpoint and, although it is concerned with the upheavals of the Napoleonic Wars, it does not really embody "Unity of Action" either, since the very different stories of the various characters and families are interwoven. 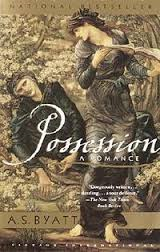 A.S. Byatt talked about her novel, Possession, which interweaves a contemporary story with a historical one: modern scholars, Roland Michell and Maud Bailey, uncover hitherto unknown dimensions to the lives of (fictional) Victorian poets, Randolph Henry Ash and Christabel LaMotte. 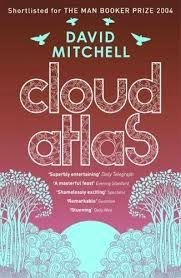 Much of the story is told through the letters, diaries and poetry of Ash and LaMotte, "discovered" by Michell and Bailey in the novel but, in reality, imaginative creations by Byatt. The creation, by a writer of one period, of texts "in the style of" an earlier period is often characterised as "pastiche," and the term is frequently used in a negative sense (its first use recorded by the OED is in an American review of Charles Kingsley's novel, Hereward the Wake - "This book is not, in our opinion, what historical novels are so apt to become - a pastiche" [Nation, NY, 25/1/1866]). John Mullan, in an article on Byatt's Possession, defines "pastiche" as "mimicry that we enjoy without being fooled," and goes on to suggest that such devices "work best while they remain merely amusing copies ... flattering the attentive reader. It is only when [Byatt's] imitations get serious that we should worry." Nobody should be "fooled" by anything in a historical novel, since it is written and promoted as fiction, but it seems to me that devices such as Byatt's (one might also mention "The Pacific Diaries of Adam Ewing" and "Letters from Zedelghem" in David Mitchell's Cloud Atlas) are an important dimension of "voice," and have the potential to be something far more interesting than "merely amusing copies." As Aristotle well understood, all art is, in a sense, a form of "imitation." Some of the most interesting recent works are those which, in structural terms, selectively abandon the Aristotelean and post-Aristotelean "unities" which dominated the novel for much of the 19th and 20th Centuries. Kate Atkinson's Life After Life, for example, explores the different trajectories that one person's life could have taken, based on chance occurrences (Unity of Viewpoint is maintained, all other unities dispensed with). 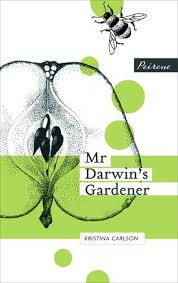 Kristina Carlson's Mr Darwin's Gardener, on the other hand, starts with "Unity of Place" (everything happens in the small village of Downe), but skips playfully between viewpoints, including even those of the jackdaws and sparrows that observe the human dramas going on beneath them. 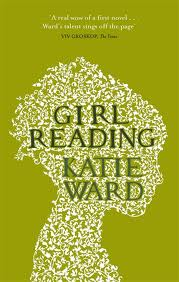 Some of these works (Katie Ward's Girl Reading, Sebastian Faulks's A Possible Life) have multiple narratives ("Unity of Action" rejected), and some (Possession and Cloud Atlas prominent among them) chip away at the boundaries of "historical fiction" as a genre. What they have in common, however, is that they are fictional attempts to make sense of the human past, and its relationship to the human present. Mark Patton's novels, Undreamed Shores and An Accidental King, are published by Crooked Cat Publications. The e-book editions can be purchased from the Crooked Cat Bookstore, and the paperback versions from Amazon UK and Amazon USA. In an earlier blog-post, (10th March 2014), I explored the question of "voice" in historical fiction, drawing on a discussion in the first session of the Folio Prize Fiction Festival, held in London last month. The second session at the festival was on the role of "place," and the panellists were Sebastian Faulks, Amity Gaige, Nam Le and James Walton. Nam Le talked about place as a literary focus, including the legacies of other writers who have been inspired by the same places: is it possible, for example, to write about the Yorkshire Moors without being influenced by the Brontes? Or fully to emerge from the shadow of Wordsworth when writing about the Lake District? 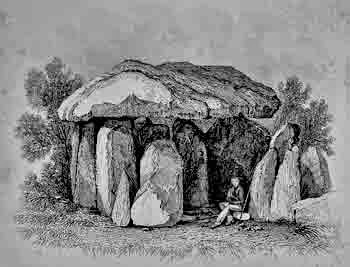 It was a question I faced as I walked from Abbotsbury to Stonehenge whilst researching Undreamed Shores - a journey through Thomas Hardy country, but how could I avoid my descriptions of the landscape sounding like echoes, however pale, of his? My solution, with every step I took, was to imagine everything through the eyes of my Bronze Age characters, stripping away the two and a half thousand years of clearance, cultivation and construction that had gone into the making of "Hardy's Wessex," and repopulating the landscape with the sights, sounds and smells of the creatures that had vanished from it before his time (bustard, red deer, wild boar). 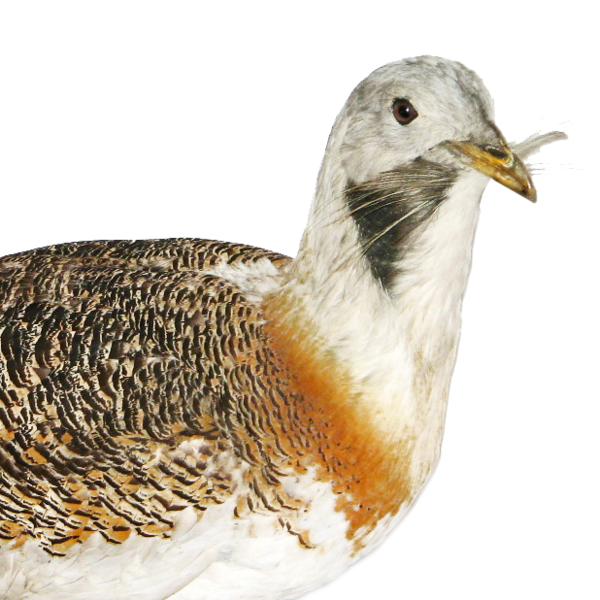 The Great Bustard, once familiar on the plains of Wiltshire, and now being reintroduced (image: Takkk, licensed under CCA). They became extinct in the UK during Thomas Hardy's lifetime, and he wrote in Return of the Native - "A bustard haunted the spot, and not many years before this five and twenty might have been seen ..."
The question of the "contract" between reader and writer, raised in the first session, came up again in the second. Once we introduce a real situation, Faulks suggested, "realism is expected." Since both of my published novels are set in the distant past, this inevitably involved me in a detailed consideration of archaeological and palaeo-environmental evidence. 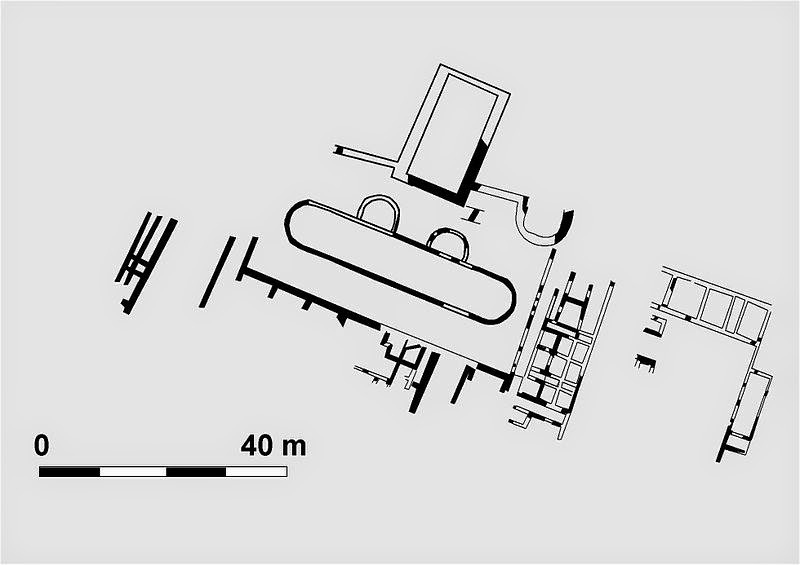 The fictional "Shrine of Belatu," in Undreamed Shores, and the settlement of "Hirundium," in An Accidental King, are, as far as I am aware, the only locations in historical fiction to be grounded in archaeological geophysics (albeit with liberal use of artistic license in the former case). There are risks, however, in incorporating such new data into the description of a historic place, since the initial interpretations of them are not always the ones that endure. 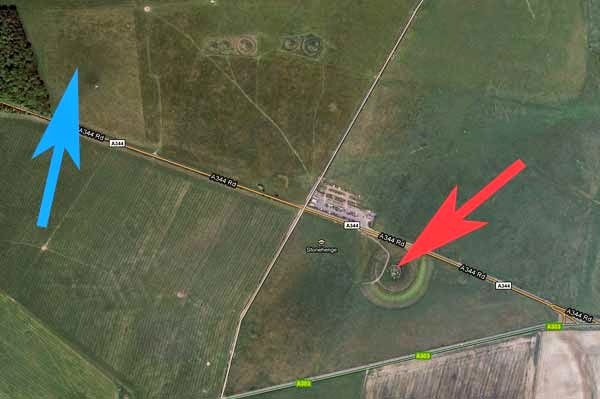 Stonehenge (red arrow) and the location of a previously unknown henge (blue arrow) discovered in the course of a geophysical project carried out by the University of Birmingham. Details were released as I was working on the final draft of Undreamed Shores, and I wrote the site into the story as the "Shrine of Belatu." Photo: Google Maps (image is in the Public Domain). 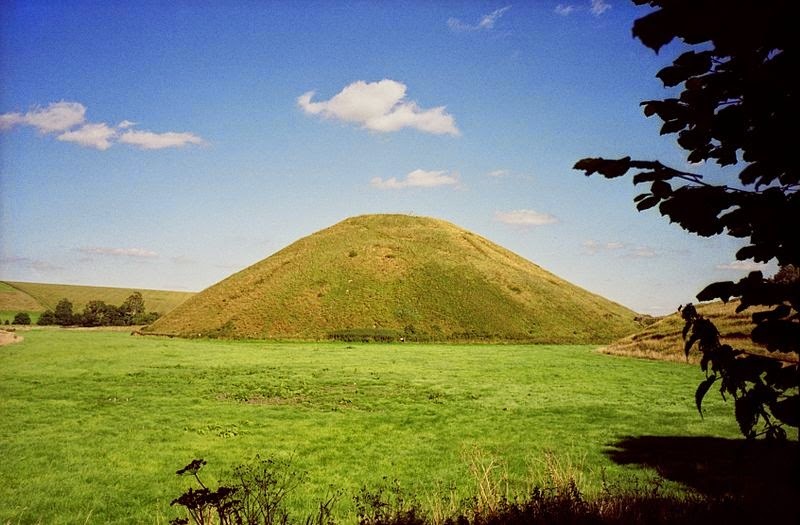 Silbury Hill, near Avebury (photo: Gary O'Beirne, licensed under GNU). A geophysical project by English Heritage revealed the traces of a Roman settlement around the base of the mound, written into An Accidental King as the settlement of "Hirundium." No such contract, however, precludes the introduction of circumstances, and even places, that are not real. Faulks stressed that the French villages which feature in Birdsong and Charlotte Gray are fictional, and talked about the difficulties encountered in finding suitable locations for the film and TV adaptations. Although closely mirroring reality (Charlotte Gray, for example, draws on the experiences of historical SOE operatives, Nancy Wake and Pearl Cornioley), the characters and situations in the novels are fictionalised, making it appropriate to invent the places as well. Some novelists go much further in avoiding "real" situations altogether. Jim Crace, for example, in Harvest, takes great care not to mention any real places, people or events, giving him a free hand to fictionalise everything. The place at its heart (referred to simply as "the village") is described in sufficient detail that a reader could easily draw a map of it. It is also, to my mind, one of the most memorable evocations of place in recent English literature, but no such place exists, or has ever existed, on the ground. When we do write about real places, however, how important is it to "get it right?" Is it always necessary that a writer should visit the places s/he is writing about? Sebastian Faulks admitted that he had not visited all of the places which feature in his James Bond sequel, Devil May Care, relying instead on the knowledge of travel writers, but he insisted that he would not do this in a "serious" (literary) novel. I have visited all of the places in Undreamed Shores and An Accidental King, but my next novel will include some scenes set in places where visits were not practical, and for which my information comes from a detailed study of historical sources and artworks. There may be some who earn enough money from their writing to travel 2000 miles for the sake of a paragraph, but I am not yet one of them. Rama (Ramallah), as depicted by Cornelis de Bruijn in 1698, one of the locations I did not visit during the research for my next novel, Omphalos. Image is in the Public Domain. There is something to be said, however, for "writing what you know" - not that a writer should be limited to this, but it seems a pity not to do so (unless, like Amity Gaige, you grew up in the same town as John Updike, in which case "what you know" might already have "been done"). 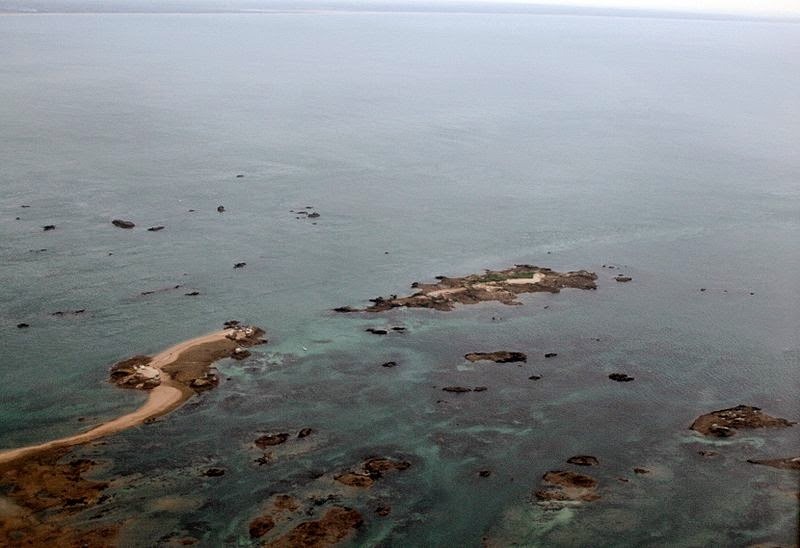 Some of the chapters of Undreamed Shores are set on the island of Jersey, and will be read differently by those who know the island as compared with those who don't, since locations all have fictional names, but can easily be mapped on to real places by those "in the know." Now that I am in my fiftieth year, however, the realisation that I have lived in London for longer than I have lived anywhere else makes me think that it is high time I wrote something set in this city, and that is likely to be the starting point for the project after next. Mark Patton's novels, Undreamed Shores, An Accidental King and Omphalos are published by Crooked Cat Publications, and can be purchased from Amazon UK and Amazon USA.